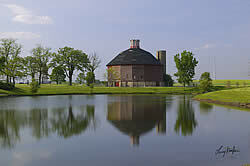 Alsip, IL–(ENEWSPF)– Photographic artist Larry Kanfer is known for striking images of Midwestern scenes. As part of the Distinguished Lecture Series at Governors State University, he will discuss his new book “Barns of Illinois” on Tuesday, June 8, at 5:30 p.m., in Engbretson Hall. A reception and book signing will follow at 7 p.m., in E-Lounge. This presentation will include the images and stories behind the barns and families featured in the book. Presenting with Kanfer will be his wife and co-author Alaina Kanfer. Alaina Kanfer is a social scientist who contributed the text that accompanies the photographs in the book. The event is free, open to the public, and sponsored by the College of Arts and Sciences and the Intellectual Life Committee. Governors State University is located at 1 University Parkway, University Park, Illinois. For more information, call (708) 534-6986.